President of the National Council for Coordination of Cooperation with the Russian Federation and the People’s Republic of China Tomislav Nikolić had a meeting with Mr. Liu Xiaofei, the outgoing Executive Board President at the Bank of China Srbija (BoC Srbija), who introduced his successor, Mr. Wang Lei. “We are very grateful to the Bank of China for operating in Serbia, and in particular for its contribution to the creation of a strategic partnership between China’s Zijin and MSC Bor. There are no points on which China and Serbia politically disagree. We have, by and large, seized the available infrastructure investment opportunities, while the Smederevo Steelworks and MSC Bor privatizations signify that our joint production could become ever more developed. I see the joint Sino-Serbian investment in third-market production as one of the projects promoted by the Bank of China in the future. As the National Council continues to cooperate with China, drafting of a joint Bilateral Cooperation Plan, drawn up in the context of the Belt and Road initiative to include all areas of the two countries’ cooperation, is underway. We are looking forward to large fresh Chinese investments in Serbia, following the privatization of MSC Bor by Zijin”, Mr. Nikolić underlined. 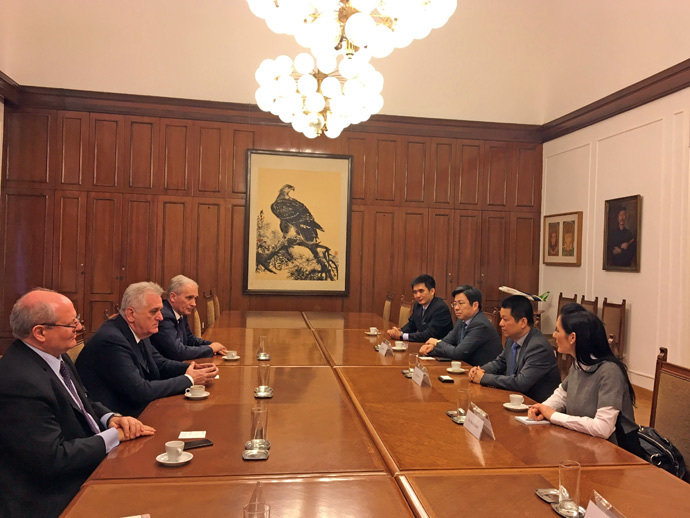 Mr. Liu Xiaofei thanked Council President Nikolić for his overall contribution to the enhancement of bilateral relations, and for boosting BoC Srbija operations. “We were greatly honoured by your presence at the CoB Srbija opening ceremony three years ago, you lent us support both at the very opening and on other projects and operations in Serbia. It was wonderful to have again at the opening of the first China International Import Expo (CIIE) in Shanghai, inaugurated last year by President Xi Jinping. Your trust tells us that we must go on with our projects. The Bank of China Srbija has more and more clients, both Chinese and Serbian big businesses and SMEs. The Bank aims to attract as many major Chinese companies to Serbia as possible, and to encourage Serbian companies to make transactions through our Bank in China. The appointment of Mr Wang Lei, an outstanding banking expert, as the new President of BoC Srbija, reflects the importance that the head Bank attaches to the development of BoC Srbija”, Mr. Liu Xiaofei stressed. Mr. Wang Lei thanked Mr. Nikolić for the audience, expressing his hope that the National Council would continue to support the work of BoC Srbija in the future, too.